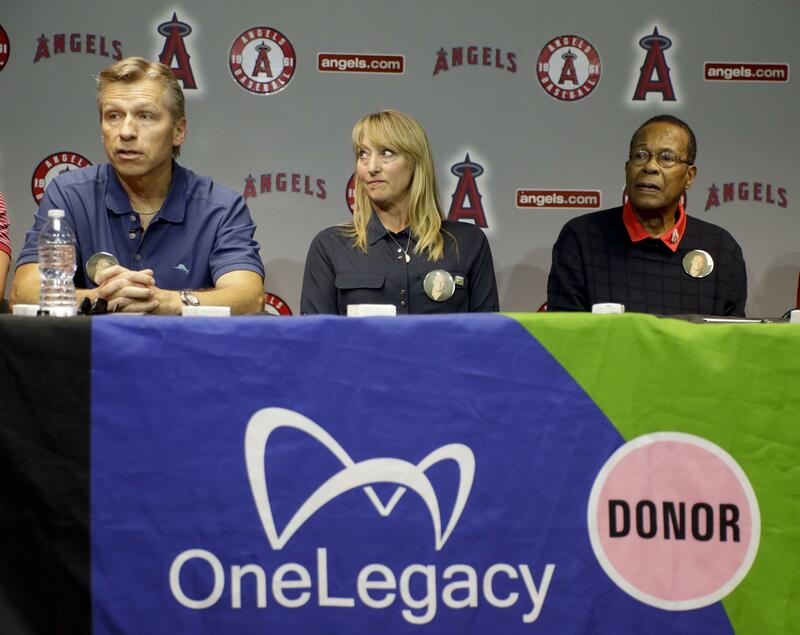 ANAHEIM, Calif. – Rod Carew and Ralf Reuland stood together in front of the mound, sharing a cause and a vision – and very much a heart. Four months after Carew received the heart and kidney of former NFL tight end Konrad Reuland, the 71-year-old watched as Reuland’s father, Ralf, threw out the first pitch at Angel Stadium on Tuesday night. “It’s very emotional, and a nice way to honor him,” Reuland said. Carew had the procedure Dec. 16 and met Reuland’s family in March after mutual friends connected Reuland’s death with news of Carew’s transplant. Reuland had died four days earlier after a ruptured brain aneurysm at age 29. The Reuland and Carew families have since joined to bring awareness to organ donation. Tuesday was one stop in the effort to get the word out. Carew suffered a massive heart attack in 2015 and had been on a waiting list for a new heart. Carew said he flat lined three times during his heart attack. Konrad Reuland was a 6-foot-6, 270-pound tight end who played for the New York Jets and Baltimore Ravens. The Reulands and Carews live 15 miles away from each other in Orange County. Their children went to middle school together, and Konrad Reuland met Carew when he was 11. The families are using the celebrity and attention from the serendipitous connection to preach the benefits of organ donation. Carew, still a bit frail but progressing nicely, said he welcomes his unexpected opportunity. Published: April 25, 2017, 8:32 p.m.